Hi-Tech Duravent has re-designed our website to make it easier to find, easier to use, and provide an overall more streamlined user experience. Hi-Tech Duravent has re-designed our website to make it easier to find, easier to use, and provide an overall more streamlined user experience. This is more than just a face-lift, as we’ve beefed up the guts as well. In addition to enhanced product pages featuring part numbers and similar products and accessories, we’ve also simplified the filtering options on the product search, making products easier to find. We’ve also optimized the site for mobile platforms, so you can easily get information on Hi-Tech Duravent wherever you are on your phone or tablet without any additional apps or downloads. This is a first of many upgrades to come, so be sure to check back regularly for more features and content. Suggestions are always welcome, as are product inquiries, so please don’t hesitate to provide those here, and as always, please give us a call at 800-348-6500 for all of your ducting needs. 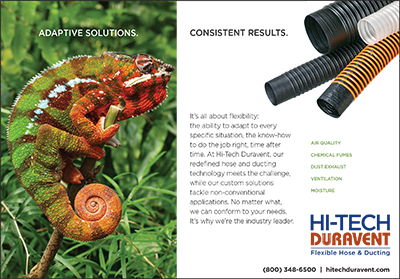 Hi-Tech Duravent is pleased to announce the launch of its new IBH hose for Insulation Blowing applications. Hi-Tech Duravent is pleased to announce the launch of its new IBH hose for Insulation Blowing applications. With an abrasion-resistant interior, durable, crush-resistant construction, and easy to drag, non-marking exterior, this hose is designed with the needs of the Insulation Blowing industry in mind. IBH is available in 50ft lengths and a diameter range of 1-4” ID. You can check out the product specs here. Hi-Tech Duravent will be attending the AWFS Fair.